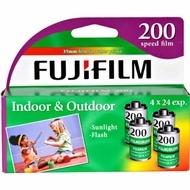 The Fuji Super HQ 200 pack includes four rolls of 35mm ASA 200 color print film with 24 exposures per roll. This film is DX coded for use with automatic cameras. The super HQ 200 is designed for general all-around use. It will perform outdoors in either sunny or overcast conditions or indoors with flash. The film can be developed using standard CN-16 or C-41 processing.